Zurn Yacht Design – since 1993 - is a full-service design & engineering company based in Marblehead, MA. With over 350 power and sailboats built in the last 20 years, Zurn Yacht Design is renowned for its aesthetically pleasing yachts. Bringing its timeless designs to discriminating clientele in sail, power and most recently, paddle, Zurn Yacht Design is the designer of choice for companies that include Marlow Yachts, MJM Yachts, Duffield Yachts, Bruckmann Yachts, C.H. Marine, Vanquish Boats, Lyman-Morse Boatbuilding, Derecktor, Salish Sea Yachts and many others. Zurn Yacht Design, together with west coast yacht builder Marshall "Duffy" Duffield, are excited to announce that the tooling for Hull no. 1 of the Duffield-58 is near completion. The Duffield 58 is one of the latest designs from the ever-expanding portfolio of its Marblehead, Massachusetts based studio. Duffield, who owns the renowned Duffy Electric Boat Co., came to Zurn with a vision of improving on an iconic West Coast trawler. 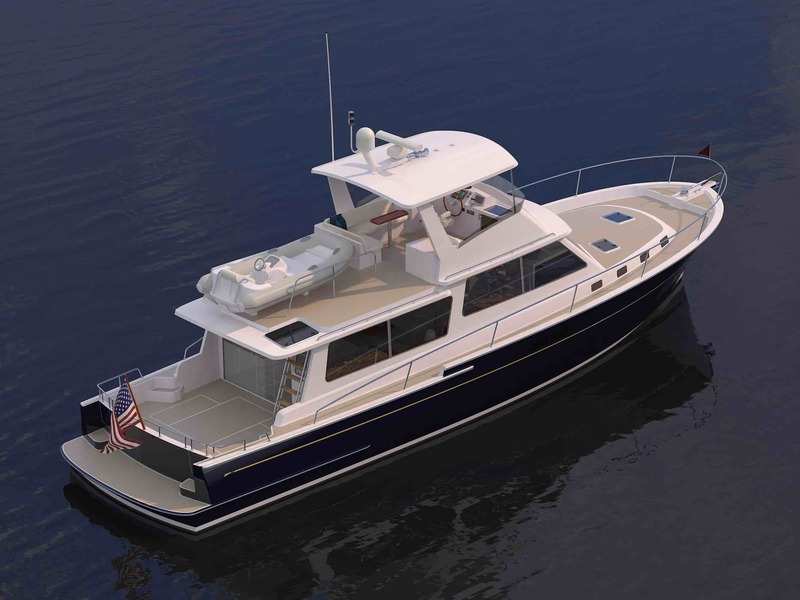 A native of Newport Beach, CA, Duffield wanted to offer quiet efficiency and energy conservation - and when he called on yacht designer Doug Zurn for his thoughts, the Duffield 58 was the result. "I wanted a traditional-looking boat that was proportionally correct and would still perform well while using much less fuel," Duffield said. "My eye caught the name of an East coast designer named Doug Zurn, founder of Zurn Yacht Designs. His boats 'looked right' to me and he emphasized using modern, advanced composite materials for fast cruising and fuel savings." Duffield's vessel will incorporate the West Coast style with interior decks that offer a 360-degree view, combined with a traditionally styled hull structure. With a relatively narrow waterline beam - a Zurn trademark - and a single Caterpillar C-18 -cycle engine set aft, away from the living space, the Duffield 58 will offer the ideal, quiet ride. The vessel is a nod to that easy-going Southern California boating lifestyle, easily owner-operated and of a manageable size. 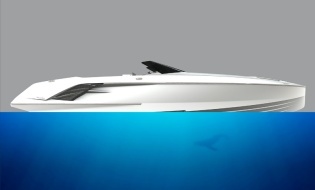 Innovation is also a key factor, as Duffield Yachts is incorporating a low cost, low maintenance alternative to conventional systems, ensuring that the boat will require less maintenance and repairs over time. Along with its universal appeal, the vessel is designed with Zurn precision and an eye toward power and durability, ensuring that the Duffield 58 is sea-kindly and fuel efficient when cruising far afield. The vessel stands out for its speed and fuel economy and at 58 feet overall, with a beam of just over 16' and a maximum draft of 3' 6", the Duffield-58 eases into any marina or anchorage. Adept and agile, it can also poke into almost any cove or shallow bay, while its cruising speed of 16 to 24 knots makes daylong, weekend or long term voyages easy to plan and execute. With a 20 GPH fuel burn at cruising speeds, there’s plenty of scope for travel and economy. There are numerous state of the art standard features, along with an array of options for individual customization. 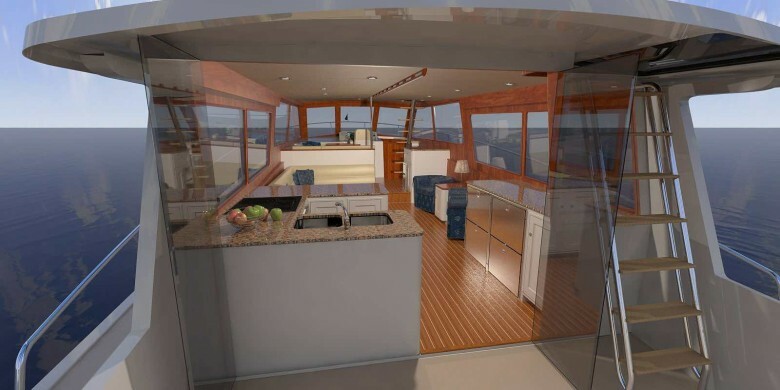 The interior is LED lit and centers around the open-plan galley and sitting area. The nearby master stateroom is comfortably situated forward, with a queen size berth and en-suite head and shower. The VIP stateroom also has it’s en-suite head and shower, accessible by guests and third crew/children stateroom occupants for day use. Hull ports draw in abundant natural light and ventilation, with a focus on ease of movement and comfort.